Pluto’s family life has been treated mysteriously in his films. Mostly, he is on his own, but in ‘Pluto’s Quin-Puplet’s (1937) he had five children, and in ‘Pluto Junior‘ (1942) only one. In ‘Pluto’s kid Brother’, without any explanation, Pluto suddenly has a smaller brother. The little brat is full of mischief, causing trouble with a rooster, a mean red cat and even teaming up with Butch the Bulldog to get some sausages from the butcher’s shop. 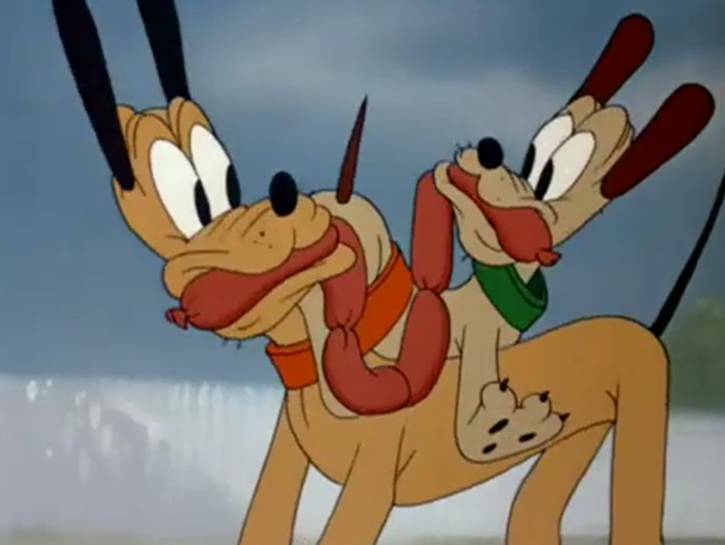 But Butch is not the type to share, and in the end Pluto has to save his brother, while Butch is caught by the dog catcher. However, there’s not too much moral to this story, for Pluto, too, fancies the loot: the sausages his little brother has stolen. ‘Pluto’s Kid Brother’ uses the same story idea as the 1936 Betty Boop cartoon ‘You’re Not Build That Way’ starring Pudgy, but with better results. ‘Pluto’s Kid Brother’ is a great improvement on ‘You’re Not Build That Way’: it’s better animated, less cloying, and more entertaining. The result is a nice cartoon, if by no means among Pluto’s best. It remains unknown whether the makers even knew the Betty Boop cartoon, at all. The red alley cat would reappear in the Figaro cartoon ‘Bath Day’, six months later. Pluto’s little brother, on the other hand, would disappear again into nothingness, never to return to the screen.